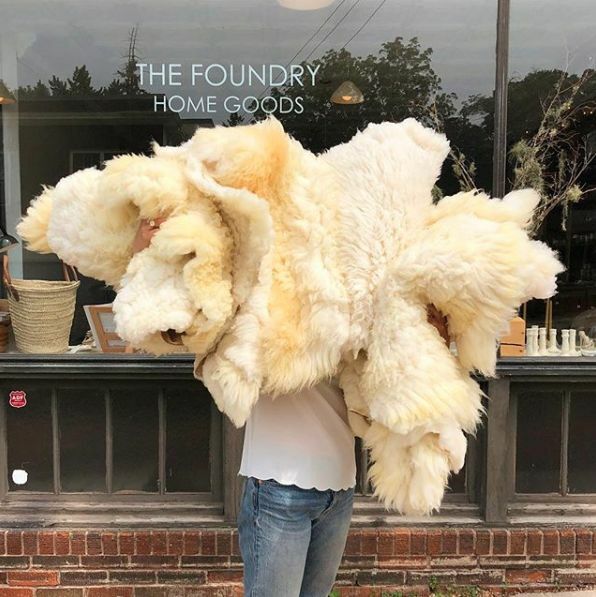 We are over the moon to have a fluffy pile of sheepskins from Sheepy Hollow in the shop! There is truly nothing like a fluffy sheepskin. Add one as a cushion to your favorite not-quite-as-soft-as-it-used-to-be chair. Lay one at your bedside so your feet have a fluffy cloud to land on all winter long. Or plop your sweet babe in a basket lined with a sheepskin, oh yes. Our friend Anne raises Sheepy Hollow's beautiful sheep right here in Minnesota on open pasture land. She also raises all of the crops they're fed (free of pesticides and fertilizers, and without any GMO crops). Sheepy Hollow meat can be found at a few local farmer's markets and the sheepskins are produced at the end of each season. Sheepskins CAN be cleaned if needed! But just like your favorite wool sweater, take extra care. Spot clean whenever possible with a gentle soap like Kookaburra or Eucalan Wool Wash (avoid Woolite, laundry detergent and fabric softeners). Bigger problem? Try a gentle soak in the bathtub. Watch the water temperature to stay under 100 degrees. You can submerge the sheepskin and let the water saturate. Give it a 10 minute soak before gently agitating. Remember, wool fibers naturally lock and tighten with movement. When it's time to dry ring the damp sheepskin to a shady spot and stretch & reshape if needed. Dry face down where the wool can get airflow. Brush out the fleece when it's damp and as needed when dry.